As we celebrate our freedom to read during Banned Books Week, it's important to remind students that many countries are not afforded this fundamental right. Countries such as North Korea, Eritrea, Russia, China, Turkmenistan, and Burma limit their citizens' right to read materials of their own choosing. Roughly two-thirds of the world's population lives under government-sanctioned internet censorship, according to a 2016 study by Freedom House. How does this relate to Banned Books Week? Challenging books--which involves one person or group advocating for the removal of the book(s) from the library or school/classroom--is a threat to our First Amendment right of freedom of speech. It's the first step in limiting access to information like the government-controlled countries previously mentioned. If the door is opened to allow one person or group to dictate what is appropriate for all, it could have negative ramifications, including other persons or groups demanding the removal of all kinds of books for various reasons. And why stop at books? The floodgates would be opened for censorship of all the information we receive. When this happens, our democracy will cease to exist. We currently have a president who does not speak out against Neo-Nazis who violently protested in Charlottesville, but speaks out against Colin Kaepernick and other NFL players who exercise their First Amendment right to peacefully protest the racial injustices in our country. Does this remind you of a scene from Catching Fire? 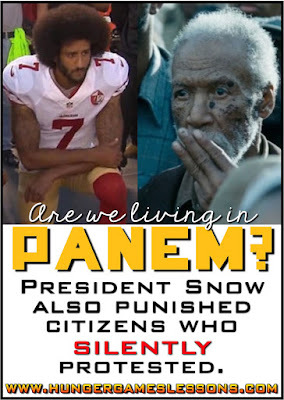 Just as Katniss, Gale, Peeta, Finnick and all the rebels in Panem took a stand against the suppression of information by President Snow, your students can take a stand against censorship by becoming "rebel readers." A rebel reader will celebrate his/her freedom to read and freedom to choose what to read. A rebel reader doesn't allow the government, media outlets, or social media to decide what is "fake news," but will seek the truth him/herself by researching the facts. 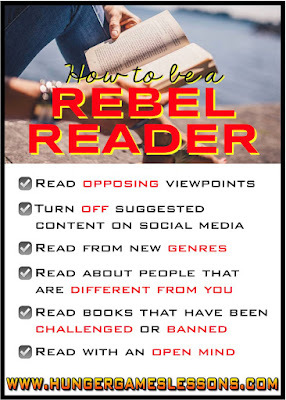 A rebel reader will step out of his/her comfort zone and read works by new and different authors about people and places and events that are foreign to him/her. 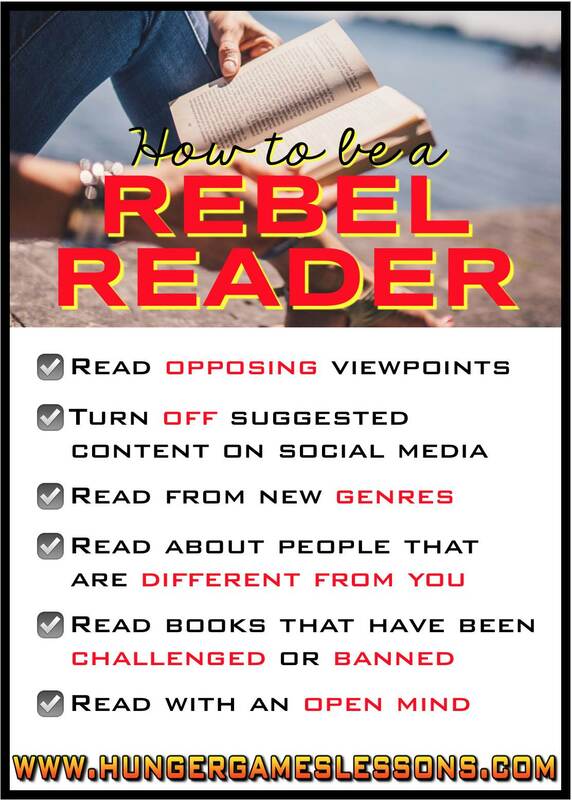 A rebel reader will read with an open mind and look at both sides of an issue or viewpoint. To encourage your students, give them opportunities to practice being a responsible rebel reader. When researching facts, require students to use several trusted and reliable sources. Surround your students with a variety of reading materials; vary the works you read with your students. • Discuss how the United States differs from other countries when it comes to censorship of the internet and news media outlets. Many students have experienced some form of internet censorship at schools with internet filters; for most, it is very frustrating to come to these roadblocks when searching for information. The difference, however, is that in our country, there are ways around the filters when necessary. But how would students feel if there were no other options? • Using the 2016 election as an example, discuss how social media filters (i.e. Facebook ads that target certain users) influenced the results of the election. If voters hadn't been bombarded with damaging articles posing as real news, would the results have been different? Ask your students why they think some people deem articles shared on social media as reliable information? Why aren't a majority of Americans turning to trusted news sites for their information? 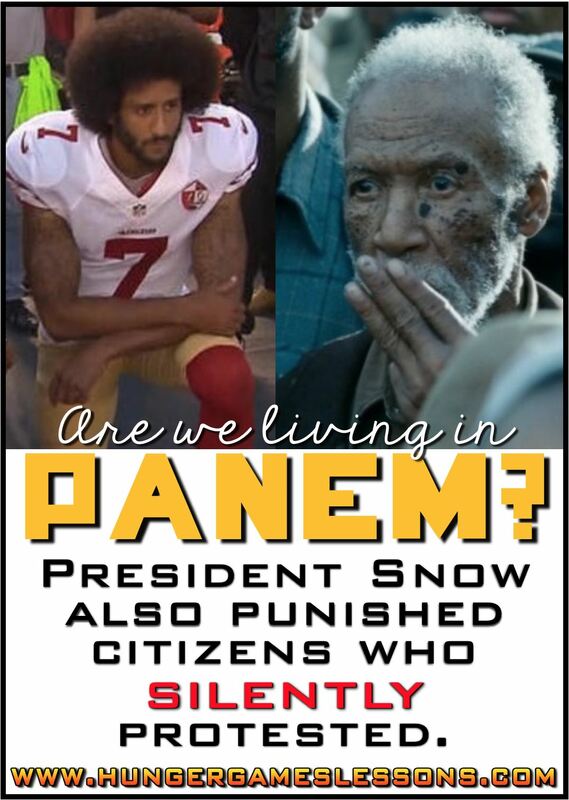 • Ask students how they feel about peaceful, silent protests. Do they think NFL players should be fired for taking a knee during the national anthem? Why or why not? If they think it's inappropriate, ask them what alternative protest could they partake in that has the same impact/viewership? • Compare today's peaceful protests with peaceful protests of the past. For example, revisit my post about Olympic protests. Why are some athletes punished, while others aren't? Does it boil down to race? What must happen for us to move on as a country? Even if you are not able to fit any "banned book" discussions or activities into your curriculum this week, try to do one thing: give your students time in class to read something of their own choosing. Let's ensure that our students realize that reading--and the freedom to choose what to read--is a fundamental right in our country that we all value. 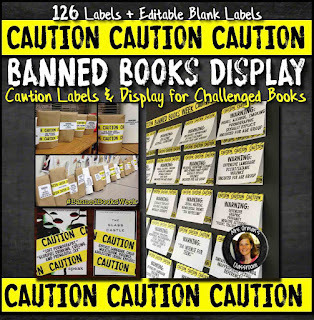 If you are in need of materials for Banned Books Week, my previous post showcases my bulletin board display and warning labels bundle, complete with an introductory activity.